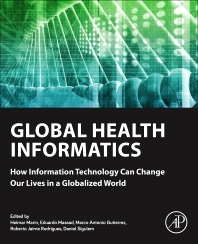 Global Health Informatics: How Information Technology Can Change Our Lives in a Globalized World discusses the critical role of information and communication technologies in health practice, health systems management and research in increasingly interconnected societies. In a global interconnected world the old standalone institutional information systems have proved to be inadequate for patient-centered care provided by multiple providers, for the early detection and response to emerging and re-emerging diseases, and to guide population-oriented public health interventions. The book reviews pertinent aspects and successful current experiences related to standards for health information systems; digital systems as a support for decision making, diagnosis and therapy; professional and client education and training; health systems operation; and intergovernmental collaboration. How to Establish an Intergovernmental Collaboration in Global Health Informatics? Heimar de Fatima Marin RN, MS, PhD, FACMI is Professor, Health Informatics Graduate Program, Universidade Federal de São Paulo; Director, Information Technology & Innovation, Hospital Sirio Libanês;Editor-in-Chief, International Journal of Medical Informatics; and Fellow, American College of Medical Informatics. Eduardo Massad is a full Professor of Medical Informatics, School of Medicine, Medicine (Diploma) USP (1979), B.SC. in Physics, USP (1984), M.D. (1984) Associate Professor of Medicine, USP (1987), Full Professor of Medical Informatics, USP (1995), Chartered Mathematician and Fellow of the Institute of Mathematics and Applications (U.K., 1999), Researcher level I-A CNPq (National Council for Scientific and Technological Development) since 1992. Honorary Professor, Department of Infectious and Tropical Diseases, London School of Hygiene and Tropical Medicine since 2003. Courage Fund Visiting Professor, National University of Singapore, 2005 -2010. Fellow of the Royal Society of Medicine (2011). Marco Antonio Gutierrez is an Electronic engineer (1985), with specialization in Electronic Computation by Mathematical and Statistical Sciences, Institute of São Carlos, USP (1985), Ph.D. in electrical engineering from Polytechnic School, USP (1995) and Associate Professor in Health Informatics, Federal University of São Paulo (2008). Currently he is Director of the Department of Computer Science, Heart Institute, USP. Collaborating Researcher on 27 research projects and technological innovation, financed by Brazilian governmental funding agencies (FAPESP). Member of the Brazilian Society of Biomedical Engineering (SBEB) and of the Brazilian Society of Health Informatics (SBIS), entity in which served as Vice President (2008-2010), Treasurer (2010-2012) and Chairman (2012-2014). Roberto Jaime Rodrigues is Consultant, eHealthStrategies, Bethesda MD, USA and Global Health International Advisors, Washington DC, USA; Medical Degree (1964), University of São Paulo School of Medicine, São Paulo, Brazil; Specialization in Surgery (1973), Beth Israel Medical Center, City University of New York, New York; Visiting Researcher (1975), Medical Informatics Department, Karolinska Hospital, Stockholm; Director (1975-1990), Technical Supporting Services, Hospital das Clínicas, University of São Paulo School of Medicine, São Paulo; Health Information Systems Advisor (1991-2003) and Consultant (2003-2007), Pan American Health Organization/World Health Organization, Washington D.C.
Daniel Sigulem is graduated in medicine from the Paulista School of Medicine (1965) and PhD in Medicine (Nephrology) by the same School (1976). Full Professor (1997) and Dean of the Health Informatics Department. Retired Professor at the Federal University of São Paulo (2009). Currently is Graduate Program Advisor in Management and Health Informatics, Federal University of São Paulo, and Scientific Editor of Journal of Health Informatics (JHI).